SOCHI, Russia (AP) Croatia goalkeeper Danijel Subasic has worn a shirt with the picture of former teammate Hrvoje Custic under his jersey for years, his way of honoring a close friend who died a decade ago. Even talking about Custic during a time of pride and enjoyment, like Croatia being in the World Cup quarterfinals, makes Subasic emotional as he broke down in tears on Tuesday when asked about his friend. Subasic’s name is on everyone’s lips back home in Croatia after his performance in the round of 16 win over Denmark, making three saves in the penalty shootout. That effort helped put Croatia into the quarterfinals for the first time since 1998. Yet Custic is always on Subasic’s mind and under his jersey. While Subasic was getting praise after the Denmark performance, he was dedicating it to Custic, who died in 2008 after being injured during a game falling into a concrete wall near the sideline of a field. Custic died a few days after being injured. Subasic has honored his friend since, and he’s also earned the respect of his teammates. ”He has a great positive energy about him and he’s always showing his emotion, including today,” Croatian defender Domagoj Vida said. It’s been a wild few days for Subasic since his effort against Denmark, which included being asked about falling off of Vida’s shoulders during the celebration after the victory. ”He’s OK. Ready for the next game,” Croatia coach Zlatko Dalic said with a bemused look. But Subasic deserved to be celebrated – maybe without being dropped – for what he did in the shootout against Denmark. Most coaches are thrilled if a goalkeeper can stop one penalty attempt. Three is rare. Subasic was the first goalkeeper to stop three penalty attempts in a shootout since Portugal keeper Ricardo in 2006 against England. The first save was likely his best when Subasic was able to get a piece of Christian Eriksen’s strike and tip it off the post. It also set the tone for the rest of the attempts to come. Subasic hasn’t received the same amount of attention as other goalkeepers in the tournament – many of whom are already back home. He wasn’t even the man of the match against Denmark, despite his penalty saves. 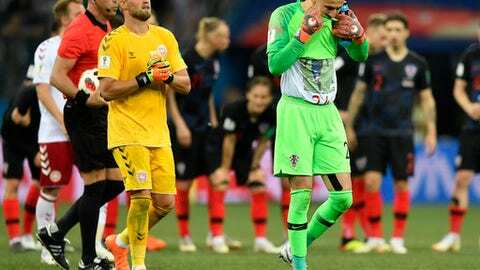 That honor went to the other goalkeeper, Denmark’s Kasper Schmeichel who deserved his own praise for stopping Luka Modric’s penalty attempt in extra time, then saving two more attempts in the shootout. But perhaps Subasic is worthy of more praise and perhaps more attention from some of the bigger clubs in Europe. He’s been a stalwart for Monaco in France’s top division since arriving on the Mediterranean coast in 2012. He was part of the group that got Monaco promoted to Ligue 1 and eventually among the elite clubs in France’s top division, playing deep into the Champions League. Two seasons ago, Subasic was named the goalkeeper of the year in Ligue 1. He’s allowed only one goal in the three matches he’s played in Russia, that coming in the opening moments against Denmark on a scramble in the penalty area.